“Oh no, I don’t want a lotion with bronzers in. I don’t want fake tan.” “If I use bronzers, that’ll make me go orange.” “No I’m not looking for a fake tan. I want a natural tan.” Let’s face it, we’ve heard it all before. You drop the ‘b’ word once, and customers go into meltdown. We know that bronzers aren’t going to make you orange. But how do you convince your clients that a bronzer will leave them looking more like a Greek God than an Oompa Loompa? In fact, how do you easily explain the basis of bronzing agents to a customer? Simply put, bronzers are designed to improve your tanning potential and give an extra boost of colour. However different bronzers affect the colour results of the tanning process differently. So whether you’re trying to help a client break through their bronzing plateau, or just aiding them get ready for the weekend, knowing the right way to explain bronzers will certainly put you on the right track to improving their golden glow. Immediate Bronzers give your clients instant colour and encourage the establishment of a base tan, while also building darker, natural colour without DHA. The tanning process takes 48 hours to fully develop on the skin. Thus, for those looking for that instant glow, tanning lotions containing an immediate bronzer are ideal. This bronzer only provides a temporary colour that will wash off and can last between 1 and 2 days depending on how long a client leaves their lotion on after tanning. What’s more, although Natural Bronzers can transfer onto clothing after tanning, they don’t stain. 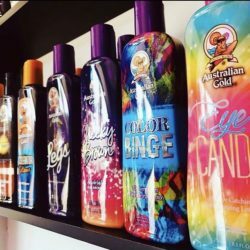 All of Australian Gold‘s bronzing agents in this category use natural-based extracts to provide immediate colour such as Walnut Shell Extract, Caramel, Henna and Melanin. Who are these ideal for? Natural Bronzers are ideal for those looking for an instant colour gratification. If someone is tanning for an event on the same day, these bronzers are an ideal way of boosting natural colour. This type of bronzer suits most skin types, as the colour provides an immediate, natural-looking glow. Top tip: When advising male clients on lotions containing immediate bronzers, avoid the term “cosmetic”. This can put some customers off as they shall associate the bronzer with makeup. Instead, try saying that these lotions will provide “an instant hit of colour” or “immediate results”. Delayed Bronzers, such as DHA and Erythrulose are sugar cane extracts which cause a natural chemical reaction to take place on this skin. This darkens a protein in the skin, meaning the more DHA used, the darker the tan. It takes between 2-4 hours to begin seeing the results, however this creates a natural tan on the upper layers of the skin. Delayed Bronzers are great for evening out skin tone and patches, creating a flawless finish, however it’s is important to always remind your clients to wash their hands within 1 hour of applying their lotion if it contains a delayed bronzer. The skin on the palms of your hands processes this differently to the rest of your skin, leaving an unnatural colour, therefore it’s necessary to wash this off. Delayed Bronzers are ideal for those looking for a deeper, developed tan as well as those looking for longer-lasting colour. Delayed bronzers last between 5 and 7 days depending on skin health. Therefore a lotion containing this type of bronzer is great for those lacking time to tan more than once a week. What’s more, delayed bronzers are useful for those looking to break through their tanning plateau. Top tip: Ingredients like DHA can occasionally dry skin. It’s always best to recommend to your clients to apply a Tan Extender, however when using delayed bronzers this is even more important to make sure your clients are happy with the longevity of their tan. Applying a Tan Extender will ensure their skin remains hydrated and allow for a longer-lasting, healthier looking tan. This type of bronzing technology contains added melanin or tyrosine. When applied, the increase of melanin kickstarts the tanning process immediately, as UVA and UVB can react straightaway. Melanin-activating bronzers provide an extra colour boost as well as an even tan. 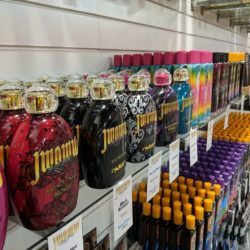 These bronzing agents circulate through the blood stream, meaning that application of this does not need to be as accurate as with a delayed bronzer to avoid streaks. Tan-activating bronzers are ideal for people with pale skin. People with skin type 2 lack in melanin compared to people with skin types 3+, therefore by providing their skin with a melanin boost for UV light to react with, their tanning process speeds up rapidly as their skin won’t rely solely on their own melanin to initially develop before tanning. Top Tip: Many of our Intensifiers contain Tan-Activating Bronzers to encourage a healthy, even tan. This bronzing technology is an Australian Gold exclusive and can be found in a range of their tanning and sunless products. 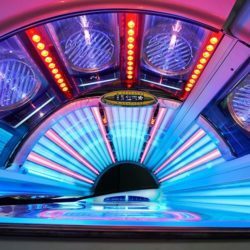 This encourages the stimulation of melanin, even without UV light. DermaDark® is a great way of enhancing colour with little maintenance. Lotions containing this bronzing agent are ideal for those lacking time to tan. The colour results are streak-free, natural and can last up to nine days. Top Tip: Lotions containing DermaDark® such as Australian Gold’s Summer Love can also be used as a daily moisturiser. The bronzing technology doesn’t rely on UV light to tan the skin. Therefore, this can be used daily to build up a healthy glow. White Bronzers stem from DHA and contain no colour. Their results are long-lasting and provide deep, dark colour gratification. If these lotions are not applied correctly, the customer’s tan may appear streaky. This is due to clients not being able to see where they have applied lotion thanks to it’s lack of colour. Therefore a beginner tanner, who may not be accustomed to applying lotion, will need to be shown how to apply this correctly before tanning. These lotions are ideal for those who are wearing light-coloured clothes or concerned about stains. This is also an ideal bronzing option for those going to events on the same day. This bronzer’s lack of colour ensures there is no transfer of colour onto clothing. Top Tip: Always remind your clients to apply these bronzers thoroughly in a circular motion to avoid streaks. Just because it’s white in the bottle doesn’t mean it’ll be light on the skin! Get your salon ready for summer	Why use a tanning lotion?